Our exceptional assessment programs are set in a serene therapeutic environment and staffed by impressive treatment teams. We go beyond other programs with in-depth assessment and prepare patients for their next level of care through treatment. Struggles with mental health and addiction issues can be so complex and complicated that typical acute inpatient and outpatient treatment options often can’t get to the root of the issues. That’s because finding clarity in diagnosis is essential to receiving proper treatment and achieving wellness. Making a decision before you know what you’re actually trying to treat can send you down a long road toward the wrong solution and even do more harm than good. A residential setting allows for a comprehensive, round-the-clock assessment that you can’t achieve in a non-residential setting. The assessment period typically spans 10 days for adults and 14 days for adolescents, which allows time for testing, observation and therapeutic engagement with the treatment team. Informed by accurate diagnostics, individualized treatment is provided to meet the patient where they are and guide them through positive progress. This helps us achieve a detailed, concise diagnostic picture that guides continued treatment. Patients of different ages have different needs. That’s why we have two separate facilities for adults and adolescents. The Williams House is our adolescent comprehensive diagnostic assessment and treatment program. It focuses on intensive assessment and treatment readiness for patients age 11 through 17 who suffer with complex, co-morbid mental health issues. Our assessment includes social interaction and observations that help us understand a teen’s ability to manipulate abstract ideas, resilience, social intelligence and over all emotional maturity. The Sibcy House is our comprehensive diagnostic assessment and treatment readiness program for adults. Often, patients arrive at Sibcy House with multiple diagnoses and a history of treatment attempts. We use proven methodologies to arrive at a conclusive diagnosis and use it to guide our patient’s individualized treatment plan. We are proud to say that we stand shoulder to shoulder with the most well-known academic and treatment facilities in the nation. Also, our leaders are globally renowned for their work in the field of psychiatry. Our patients receive in-depth clinical attention from physicians and doctorate level professionals in a safe, warm environment that offers the utmost discretion and confidence. Sibcy House and Williams House both truly offer a unique and effective therapeutic experience. Internationally recognized for progressive programs and exceptional skills, our clinicians look forward to working with you to help your patient achieve lasting wellness and a healthier, more fulfilling life. At the Lindner Center of HOPE, we believe that an accurate diagnosis is the cornerstone of successful treatment. Often, patients arrive at our program with multiple diagnoses and a history of treatment attempts. Because emotional issues can be so complex, we work very hard to arrive at a conclusive diagnosis before beginning treatment. Our clinicians use proven methodologies to diagnosis and create each patient’s individualized treatment plan. From there, we use a comprehensive approach to care, including research based treatment, nutritional education, individual therapy and group therapy including Cognitive Behavioral Therapy, Dialectal Behavioral Therapy and daily mental health specialist groups on topics relevant to the patient. Our programs are designed to ensure our patients’ success. When a patient is finished with our initial program, we make sure they have the continued support they need. That may mean continuing their stay on a week by week basis. At the very least, a summary of diagnostic results and treatment recommendations are provided upon discharge. With the consent of the patient, we provide a blueprint for continued treatment to referring professionals and continuing care providers to provide continuity of care long after a patient leaves the Lindner Center of HOPE. We treat a variety of disorders, as well as complex, co-occurring disorders. Our program is built to dive deep into the heart of these issues and treat disorders both individually and together. Here are the disorders we diagnose and treat. Our team of clinicians, along with internationally recognized research and state-of-the-science technology can helps each patient reach long lasting positive outcomes. We are proud to say that we stand shoulder to shoulder with the most well-known academic and treatment facilities in the nation and our leadership is globally renowned for their work in the field of psychiatry. 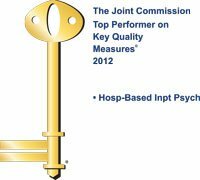 Recognized by The Joint Commission as a Top Performer on Key Quality Measures® for achieving excellence in performance on its accountability measures during 2012 for Hospital-Based Inpatient Psychiatric Services. Lindner Center of HOPE is a charter member of an elite group of hospitals and universities in the National Network of Depression Centers (NNDC). We are dedicated to the transformation and acceleration of the understanding and treatment of depressive and bipolar disorders by developing an integrated network of leading Depression Centers The Center joins Columbia, Duke, Harvard and Johns Hopkins, among others. Lindner Center of HOPE is one of 22 members of the NNDC and was invited to join within three months of opening. Learn more about our affiliations here. Our clinicians not only have access to the most current evidence on which to base their treatment, but the ability to implement innovative treatments into its clinical practice years ahead of general practice. Paul E. Keck, Jr., MD, Lindner Center of HOPE’s President and CEO, and Susan L. McElroy, MD, Chief Research Officer, are among the top 10 most cited scientists publishing in psychiatry and psychology every year since 1996. Charles F. Brady, PhD, ABPP, Psychologist, with his advanced training in Cognitive Behavioral Therapy, is renowned for his expertise in Obsessive Compulsive Disorder and Anxiety. Learn more about the Williams House team here and the Sibcy House team here. “I was treated with dignity and respect” (4.61 out of 5). “I would recommend Sibcy House to someone else.” (4.5 our of 5). Of the center, former patient, J. Greg Bragg has said, “I’m not just living again, I’m flourishing.” For more about our patients’ experiences, read some of our patient success stories. Research and clinical studies are extremely important to our work. This research provides new methods to better prevent, diagnose and treat common mental illnesses in adolescents, adults and seniors. Research studies and the advances they lead to are closely integrated into the evidence-based treatment programs provided at Lindner Center of HOPE. Historically, there has been a 17-year lag time before research findings are integrated with the diagnosis and treatment of patients. However, at Lindner Center of HOPE, research informs patient care each and every day. Find out more about our researchers or clinical trials. Lindner Center of HOPE offers an experienced, high-functioning, and cohesive treatment team working together to provide clear, detailed diagnostics and highly personalized treatment recommendations for our patients and their families. Learn more about the Sibcy House Team here and the Williams House Team here. We are writing to express, briefly, our most sincere thanks for the gift of hope and life given to our daughter as a result of her stay at Sibcy House last February. Anna had suffered for 16 years, beginning with a sexual trauma and betrayal by a friend, which she kept hidden from us for 2 years, at the age of 16. She developed a severe eating disorder, which almost killed her and which lasted for most of these years of suffering. During that time, however, her mental health spiraled down dramatically, and by the time she was admitted to Sibcy House, she was diagnosed with PTSD, anxiety, mood disorder, and the eating disorder, and probably more than that. We are certain that her healing is a miracle resulting from two powerful sources – unceasing prayer…..and…..modern psychiatric medicine and treatment and the outstanding care she received at Sibcy House. We will never be able to adequately express to you how grateful we are for the part that LCOH/Sibcy House has played in Anna’s transformation to life. Going from a person plagued by all of the above to the consistently happy, grateful, goal-oriented, independent young woman that she is today is nothing but a miracle. Those who were closest to her in her last downward spiral before Sibcy House just sit and stare at her in amazement – they just cannot get over the change, which has lasted now for almost 9 months! There seem to be no ups and downs at all – she is just consistently steady, prospering and full of joy! She jokingly refers to herself as “everybody’s favorite miracle”! We thank God, from Whom all gifts and goodness flows, for the wonderful and skilled people He put in her life at the perfect time (although it was such a long time for us to wait, watching her suffer for all those years, suffering along with her). We thank everyone at Sibcy House who worked with Anna and we’d love them to know how well she is doing. Anna is now living on her own in D.C. (with our financial support at this time), working M-F (walking dogs, of all things!) and is applying for grad school in fine arts. Thank you, thank you, thank you, Sibcy House staff and benefactors, for your integral, life-saving work in the restoration of our daughter! When recapping the experience of when mental illness enters a family, where do you start? The adoption process? The sweet baby child 6 months old from a foreign country? The always smiling and laughing little boy? The losses he experienced in high school of his uncle, grandpa and friends (several friends died from drug overdoses) that contributed to a downward spiral? Or the problem child at puberty who grew silent and sullen, easy to anger, non-communicative and slipping into alcohol and drug use? The story of Adam is one of extreme contrasts, and how his life went from joy to depression…and all the associated behaviors that this brings. by friends and family, and he was considered an all-around “good kid” by everyone who encountered him. Aside from headaches that plagued him for the last year and a half, things seemed as close to perfect as they could be for this 17-year-old, preparing to enter his senior year of high school. However, in early Spring he began complaining about nausea that persisted for several months. Unable to uncover a diagnosis, Luke’s mom, Gretchen, and dad, Robert, took him to specialists outside of New England. During this trip, some of Luke’s behaviors began to seem unusual to Gretchen and Robert. Meanwhile, the specialists suggested that the cause of Luke’s nausea was anxiety; and recommended Cognitive Behavioral Therapy and Dialectical Behavioral Therapy. Luke’s behaviors continued to be bizarre into the summer. The family was on vacation and Luke started a fight with his dad, which resulted in police being called and Luke in handcuffs. Luke was completely out of character. After conversations with the doctors, Gretchen and Robert decided to have Luke discontinue taking medication he was prescribed for his headaches, in order to eliminate concerns about negative side effects. Mood swings and paranoid behaviors became more consistent and landed Luke in the emergency room two more times and in two different psychiatric facilities. Gretchen and Robert knew they needed someone to help them sort through this. It was clear that they needed an accurate diagnostic picture and a treatment plan with recommendations that would guide them in their next steps. Having some professional connections in the mental health field, they received several recommendations that Lindner Center of HOPE’s Adolescent Diagnostic and Treatment Program, called Williams House, could help. Even during the admission process, Gretchen and Robert said they could feel a deeper level of support. On July 18, Luke was admitted to Williams House. Dr. Nicole Gibler, psychiatrist, staffed Luke’s case. Luke discharged from Williams House with a medication regimen, and supports in place, including an educational consultant who will continue to provide guidance to Gretchen and Robert as they follow treatment recommendations for Luke. Exactly one year prior to the time this article was written, J. Greg Bragg, now 37 and living in Alabama, set foot into Sibcy House at Lindner Center of HOPE for the first time. Ten years prior to that, he began experiencing panic attacks. At that time, there was a lot going on in his life and he resorted to self-medication with alcohol. After three years of using alcohol to manage his panic, Greg went into treatment for his addiction in Atlanta, Georgia. But his panic attacks went unaddressed. He has maintained his sobriety since that time. “My world just kept shrinking and shrinking. Eventually, the most I could do was go to work and come home,” Greg said. was made, but the next hurdle was to get to the Center. What could have been a six hour trip from Alabama to Cincinnati, ended up taking three days with panic attacks forcing Greg to stop frequently. First exposures were completed side-by-side with staff, then Greg was given the flexibility to complete exposures on his own. When Greg would feel his anxiety coming on, he would get sensations in his feet that felt hot and tingly. As an exposure, staff had purchased the feet warmer packets from a local sporting goods store and instructed Greg to wear them all day. The goal was to help desensitize him from that feeling that signified his anxiety. His family visited Ohio while Greg was on a weekend pass, the visit was an exposure for Greg as he stayed at a nearby indoor waterpark with his wife and children. Therapy skills were critical in preparing him for his drive home after discharge. “You get out of something, what you want to put into it. I was super motivated when I got to Lindner Center of HOPE. You have to be open and trust the professionals,” Greg stated. After eight years without enjoying an evening out for their anniversary, Greg took his wife out to eat in Atlanta this year. A testimonial from a young man and his family about their journey with OCD. When their son Colton was in preschool, Lynn and Todd started noticing that Colton’s bedtime rituals were taking an hour or more to get him to the point where he could go to sleep. And though they enjoyed his hugs, they noticed that he needed a certain number to be able to move on to the next thing. At school, if Colton had written on a piece of paper… he absolutely had to keep it or make sure it was thrown away in a certain trash can. Lynn and Todd could see their son’s anxiety increasing as he grew, and along the way he developed more rituals and contamination concerns. Lynn and Todd recall doing a lot of research that lead the family to Colton’s eventual diagnosis of Obsessive Compulsive Disorder (OCD). When you ask Colton, he states that he has had OCD since birth, but received his official diagnosis in sixth grade. Colton explained that he has fears related to using a brand of hand soap offered at his school, so he compulsively overused a hand sanitizer at school. Otherwise, he was spending a long time washing his hands with other brands of soap. We offer a variety of evidence-based treatment methods, including DBT, CBT, ERPT, The Maudsley Approach, and many more. Clinicians at Sibcy House at Lindner Center of HOPE are dedicated to bringing the latest treatment methods to patients and families. Dialectical Behavior Therapy (DBT), Cognitive Behavioral Therapy (CBT), Exposure and Response Prevention Therapy (ERPT) for OCD and Maudsley Treatment for eating disorders are commonly used in the Sibcy House program. Intensive treatment and clinical skills development are largely based in DBT, but enhanced by other evidence-based treatment models. Dialectical Behavior Therapy (DBT) is a form of psychotherapy intended for those who exhibit a more chronic form of emotional instability with numerous coexisting problems. More recently, DBT has been shown to be effective with individuals who are suffering from mental illnesses that include behaviors such as suicidal ideation, and addictive disorders. DBT is a form of psychotherapy that asks the individual to look at their problems and behaviors and find a different, more effective way to resolve them.DBT focuses on the “here and now” and breaks situations into manageable steps toward a long lasting and more positive outcome. Cognitive Behavioral Therapy (CBT) is an empirically supported treatment that focuses on patterns of thinking that are maladaptive and the beliefs that underlie such thinking. The goal of CBT is to train patients to become their own therapist. Those in CBT learn skills that help them to make changes in their approach to situations by evaluating how they can modify their own behaviors and thoughts to better manage outcomes. Studies of CBT have demonstrated its usefulness for a wide variety of problems, including mood disorders, anxiety disorders, personality disorders, eating disorders, addictive disorders, and psychotic disorders. Exposure and Response Prevention Therapy (ERPT) helps the brain recalibrate, greatly reducing any anxiety or distress caused by OCD. With ERP, the patient, guided by licensed psychotherapists, learns to face obsessions while reducing or eliminating compulsions to neutralize their anxieties. The Maudsley Approach is more commonly known within the scientific community as Family-Based Treatment (FBT) for the treatment of eating disorders in adolescents. However, it is not traditional family therapy. Within this approach, the eating disorder is seen as an illness and the family is seen as the solution to the problem. The Maudsley approach only deals with problematic family patterns inasmuch as these patterns interfere with the elimination of the eating disordered symptoms and the reestablishment of normal adolescent development. Sibcy & Williams Houses lie within the walls of Lindner Center of HOPE. The Center is built on an innovative, scientifically-based model and provides a complete continuum of mental health services. Here, the components of a mental health care center of excellence – state-of the-science technology, extensive diagnostic evaluations, individualized treatment, internationally recognized research and renowned physicians – are integrated into a facility where patients, families and clinicians work in synch to create long-lasting solutions. Sibcy & Williams House patients benefit from a robust offering of treatment modalities, ensuring the treatment plan most compatible to their individual needs. Our Spiritual Care Professionals compassionately affirm the dignity and value of each individual and honors the right of each faith group to embrace its ideals and traditions, including religious diversity. Uniquely designed to seat up to 32 people, the Faith Center offers a tranquil atmosphere to enhance the essential spiritual care we provide for our patients and their families. The Faith Center includes a piano and a meditation garden. Learn more about Spiritual Care here. Lindner Center of HOPE understands that financing options may be useful to patients and families as they consider how to manage diagnostic and treatment expenses. To that end, Lindner Center of HOPE evaluated some financing options that may be able to assist patients and families. Below are two lending companies, that have experience in assisting families in need of mental healthcare and addictions services. Lindner Center of HOPE provides information about each company, strictly as a resource for patients and families and is not affiliated with and/or endorsing either company. Prosper HealthCare Lending is the premier financing company in the behavioral health industry. With over $3 Billion borrowed and over 250,000 people empowered, this is a name and a program you can trust. *Please note that Lindner Center of HOPE Professional Associates (LCOHPA) does not work with Prosper Healthcare Lending. M-Lend Financial has served the Medical Community for 20 years.